A Group photograph taken in 1961 in the courtyard of the school above the basement where the Sliema Group has it's Headquarters. On the Group Chaplain's left is Group Scout Master Edward Tortell, Scout Master John Camenzuli, and myself Senior Scout Master (in wide brim hat). 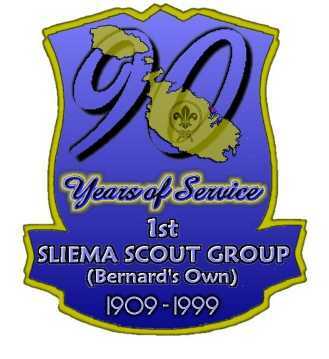 The 1st Sliema Scout Group was founded in 1909, and is one of the oldest surviving Scout Groups outside the United Kingdom. They celebrated their 90th anniversary in October 1999. They wear a red neckerchief. I first became involved in Adult Leadership in Scouting with 1st Sliema in the mid 1950's. Having instructed youngsters in caving, climbing, canoeing and subaqua diving for some time, I was approached by their legendary Group Scout Master, Edward Tortell (aka 'Wings'), to take some Boy Scouts rock climbing. I have never looked back and am still very much involved in Scouting thanks mainly to 'Wings's' enthusiasm for the Movement. Traditionally most members of 1st Sliema from Senior Scouts upwards were given nicknames. Mine was to be 'Beaver' when I finally became an Instructor in 1958 and invested as Assistant Scoutmaster (Seniors) on 17th October 1961. Their Headquarters was, and still is, the spacious basement of a large infant school in Sliema, a seaside town on the north coast . The basement was used as a Military Hospital during the 1st World War, and ghost stories abounded. I experienced two such 'happenings' myself in the early 60's. The first remained unexplained, the second was terrifying but had a strange explanation. The Unexplained: I was crouched on the floor one late night, alone in the basement Headquarters, making up a large display knotting board. Shortly before midnight a piece of chalk came rolling at me from some 5 yards away and stopped when it hit the knotting board. There was no-one else in the hall, all windows were locked shut, front door was closed, and there was absolutely no reason for this piece of chalk to leave the foot of the blackboard we had screwed to the wall. I quietly packed up for the night and went hastily home. I mentioned the fact to Wings the next day and he reminded me of the 1st World War patients and their suffering, and sometimes death in our Headquarters. I never received a satisfactory explanation. The Explained: Some months later, on a winter's day, I was quietly making an inventory of our climbing and caving equipment, of which we had plenty. On this occasion the time was past midnight. I was sitting on a wooden bench at the Mitchell Patrol table facing the wall. Remember, this wall was underground. Without hearing anything, or any warning, I suddenly found myself being poushed in the chest and went sprawling backwards on to the floor. I never wish to experience again the cold sweat that rolled down my face when I looked around and saw no-one else in sight and no obvious cause for what had pushed me off the bench. I was quite frightened, and ran outside into the street. A man was strolling past walking his dog. I asked if he had either seen anyone or perhaps felt an earth tremor. He replied no to both and walked away. It was not till late the next morning that news hit the streets of an almighty explosion in a fireworks factory some 6 miles away from our Headquarters. It happened to be at the same time that I was pushed off my seat. Malta being geologically mostly limestone, the shockwaves from the quarry where the explosion occurred, travelled through the rock till it emerged through the wall of our Headquarters. It didn't half pack a punch! Please visit 1st Sliema Group's Web Site. Copyright since 1998 ãPaul Calleja-Gera - All rights reserved.